Sunrisers Hyderabad will be looking to bask winning form in the Indian Premier League on Sunday when they face Chennai Super Kings (CSK) at the Rajiv Gandhi International Stadium in Hyderabad. The Sunrisers started their campaign with three consecutive wins. In their fourth match, the 2016 champions were defeated by Kings XI Punjab on matchday 16th of the Indian Premier League by 15 runs with Chris Gayle being the difference maker. Kane Willamson's side will be looking to enjoy their home advantage against an in-form Shane Watson, MS Dhoni and Suresh Raina starrer side. After being thunderstruck by the Universe god — Chris Gayle in their last match against Kings XI Punjab, the 2016 champions Sunrisers Hyderabad will be eager to put their Indian Premier League title quest back on track when they face Chennai Super Kings (CSK) on Sunday at the Rajiv Gandhi International Stadium in Hyderabad. High flying Sunrisers Hyderbad were brought down to Earth by veteran batsman and self-proclaimed Universe god, who smashed the first century of the IPL 2018 by destroying Kane Williamson’s side. SRH were defeated by Kings XI Punjab on matchday 16th of the Indian Premier League by 15 runs with Chris Gayle being the difference maker. 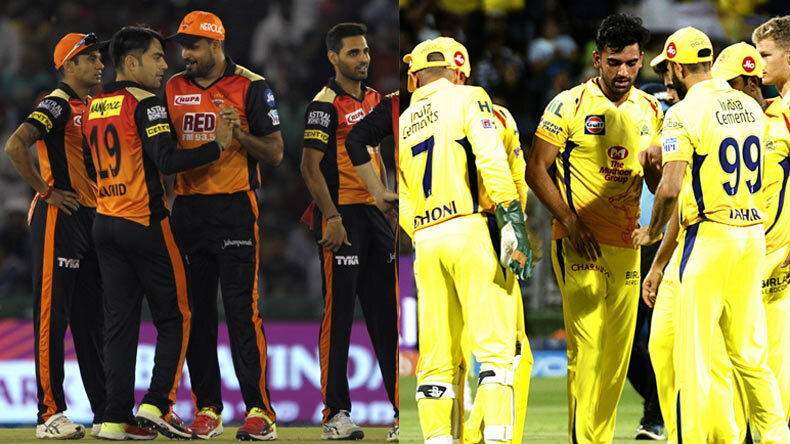 While SRH tasted their first defeat, Chennai Super Kings on the other, forced Rajasthan Royals to register back to back defeats in the IPL on Friday. Riding on Shane Watson’s 3rd IPL ton, Chennai Super Kings eased past the 2008 champions in their new Pune home. Both teams are currently levelled on points with Chennai Super Kings having a bigger say on the table thanks to their impressive net run rate. The Hyderabad outfit started their campaign with three consecutive wins before meeting the Universal God who handed them their first defeat this season. Putting the Gale chapter behind them, Kane Willamson’s side will be looking to enjoy their home advantage against an in-form Shane Watson, MS Dhoni and Suresh Raina starrer side on a super Sunday. While an impressive Chennai can headline the mega-clash with their famous trio, a resurgent Hyderabad will be focused on getting the better of the visitors. Bhuvneshwar Kumar, Siddhart Kaul, Shakib-al-Hasan and Billy Stanlake are top wicket-takers for Willamson’s side.